It seems that I find myself borrowing an oscilloscope more and more frequently (it was instrumental in reviving my H89). However, I think I've reached the point where I just need to buckle down and buy one of my own. Therefore I'm curious as to what kinds of scopes y'all have found to be the most useful in diagnosing and maintaining your vintage computer collections. What kinds of specifications have worked well for you? It depends a lot on what you want to see. The first scope I used on the job in real life was a Tektronix 465 (100 MHz cathode ray oscilloscope). It was good at showing repetitive events, and that *something* was happening on less repetitive events, but was useless for one time events, or decoding bit streams, or whatever. This is, however, the general kind of technology that a design engineer or technician might have used on your vintage stuff back in the day. Historical note: the phrase "Cavemen used oscilloscopes to debug fire" was referring to the Tek 465, or maybe the 454, and comparing them to primitive logic analyzers. My Tek 475A (same thing but 250 MHz bandwidth) is generally still my scope of choice for digging into switching power supplies, etc. I have a now-old Tektronix TDS380 (2 giga-sample/sec 8-bit digital storage scope with a 400 MHz front end). Nice for capturing edge-related problems, but memory is too limited for decoding bit-streams, etc. I keep a similar 50 MHz TDS310 in my office at work, just for general-purpose troubleshooting and to look at 1-Wire signals. Some of the newer Rigol units are well spoken of for workhorse use. Bandwidth of 50 MHz and up, possibly with serious memory depth. Bandwidth: a 100 MHz scope allows you to see a 100 MHz sine wave. You might need a 500 MHz to 1 GHz scope to see a 100 MHz square wave accurately. Channels: 2 is the absolute minimum. Four can be very useful, to the point that many people who get used to a four-channel scope will not go back to 2. 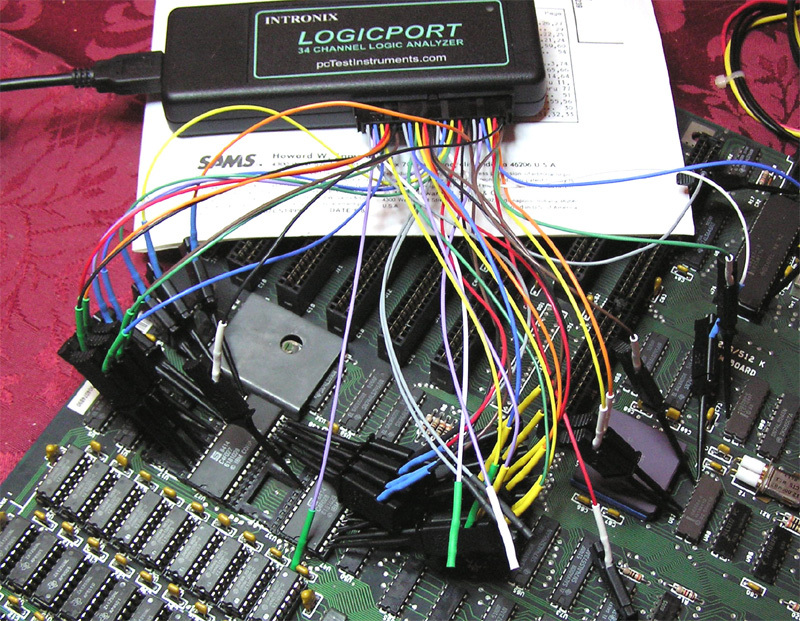 A logic analyzer or protocol analyzer might be better for showing you some things. I'm still very new to working with scopes, but I like the 2 Channel 100MHz Rigol that I picked up. It also reviewed well and I think it will get me through most of my hobby needs. If I was going to buy a brand new scope on a budget I would probably take a look at the Rigol DS1054Z. For $400 that is probably hard to beat for something brand new. Here is the EEVblog look at it and there are a lot of other videos and reviews out there, and information on how to unlock the upgrade codes. I bought an Agilent InfiniiVision 3000 X-Series scope, but I wasn't on a tight budget. Rigol also makes mixed signal scopes. They are more expensive (about $800), but logic analyzer function is really useful for debugging digital circuits including computers. My advice - get something dirt cheap at a flea market, craigs, or ebay. Then go from there. Shoot for a sampling rate of at least 3x the frequency of what you expect to be looking at. For the most part I think you'll simply be looking for the presence of square waves, not scrutinizing rise and fall times or whatever. Jackpot! I got exactly the kind of present I needed for doing the kind of repair work I need to on my vintage computer collection: a Tektronix 2445B. It's got 150MHz bandwidth, 4 channels, a few cosmetic scuffs, and markings indicating that it was last calibrated in October of 2013 by the previous owner if the stickers are to be trusted. I just need to go and buy myself 4 proper probes to replace the two that came with it (they are in bad shape). I have a Tek 2432A, the 2 channel, 250Mhz version of the 'scope that you have. They are very easy to use and very reliable. I have a Tek 2432A, the 2 channel, 250Mhz version of the 'scope that you have. No, the 243x and 2440 are 2 channel digital storage/sampling scopes with various bandwidths and sample rates. I used to own a 2430A, which is a 100 MS/s scope with a 150 MHz front end. I believe that the 2432A is a 250 MS/s scope with a 300 MHz front end. But the 2445B that CommodoreKid has is a 4 channel analog 150 MHz scope (little brother to the 2465B).